The Protestant reformation had a valid point in its rebellion against the practices it perceived to be idolatrous. After all, there is no God but God, and no earthly things - whether people, statues, or cathedrals - can substitute for the Eternal and Infinite nature of a God that always eludes the conscious understanding of our finite minds. Everything in this world remains imperfect, and it's good to be reminded of that. Likewise, the same applies to spiritual experiences and the mysticism that I often discuss in this blog. Whether being filled with the Holy Spirit in ecstatic reverie or resting in the Presence of God during centering prayer, one's experience of the divine is never completely pure. The Spirit enters through the tainted vessel of our humanity, and if one takes original sin seriously, then it obviously follows that our own understanding of God will be distorted by our own mortal imperfections. Humility. Rarely, though, do we hear this mentality applied to doctrine or to the Bible itself. The fact that orthodox theology and holy scripture entered existence through groups of imperfect humans is not something we want to emphasize. The fear is that doing so will undercut the power of the Bible and doctrine: first, we admit it's not perfect, and gradually, it's reduced to mere literature and philosophy. However, I think there is a middle ground between treating the Bible as if it is God (which many churches can do) and reducing it to mere "wisdom literature"( which some churches also do). Humility is this middle ground. Taking original sin seriously means that we cannot make our own perspectives too important, whether in understanding scripture or in determining our own value systems. We must remember that our own vehicle, "us," is broken. How can an imperfect human understand a Perfect God? Seeing the ludicrous nature of this proposition is the beginning of humility. St. Thomas Aquinas, upon finishing his Summa Theologica, supposedly had a mystical experience where he glimpsed the Vast Infinity of God. After the experience, he claimed that everything he had just written (which came to be regarded as the pillar of Orthodox Catholic Theology) was "mere straw compared to what I've seen." 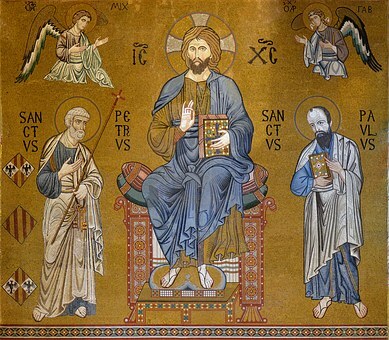 The Doctor of the church knew better than to place theological doctrine over an Infinite God. Theological doctrine and biblical studies can help us grow and understand God better, but we must remember that our own understandings, however devout and well-studied, will always be scratching the surface at best. As Jesus reminds us in John, “I have yet many things to say to you, but you cannot bear them now” (Jn. 16:12). Older PostCan Words Poison Us? A quick chat with Rumi and Merton.